Barrett-Jackson’s auction at the Mandalay Bay casino in Las Vegas in late September included a reasonable amount of vehicles from the 1980s—about 4% of the 736 lots offered. I’ll concentrate on the at least reasonably stock 1980s cars (and a few trucks) that sold and add some of my opinions—I’ll leave the motorcycles, tractors, and automobilia to others. Where I have covered the specific year and model of a car in this blog, I link to it. 1981 bronze Datsun 280ZX hatchback coupe with tan seats, an L28 145 bhp 2.8 liter/168 ci inline six with Bosch L-Jetronic fuel injection, a five-speed manual, and 115,000 miles—$8,250 hammer price. 1986 beige Toyota pickup truck with tan cloth seats, a 22R 2.4 liter/144 ci inline four, a five-speed manual, and 44,000 miles—$18,500 makes this the first vehicle in this auction to meet my criteria for serious 1980s collectability of mostly or entirely original cars or trucks: selling for equal to or above its original base list price. I’ll mark these vehicles in bold green. 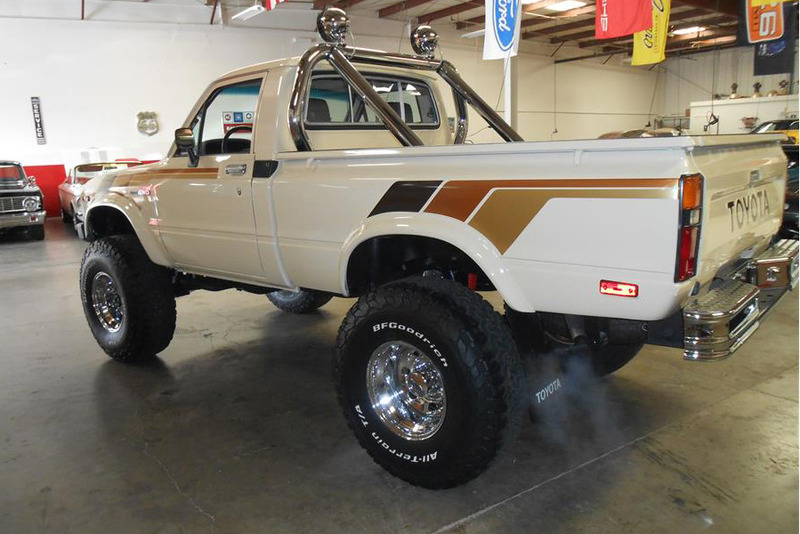 1983 beige Toyota SR5 mild custom pickup truck with tan cloth seats, a 22R 2.4 liter/144 ci inline four, and a five-speed manual—an astounding $50,000. 1983 Toyota SR5 pickup truck, linked from Barrett-Jackson’s website. 1982 white Buick Riviera convertible with burgundy leather seats, a 150 bhp 5.0 liter/307 ci V8 with a Rochester M4MC four-barrel carburetor, and an automatic—an ouch! at $3,500. 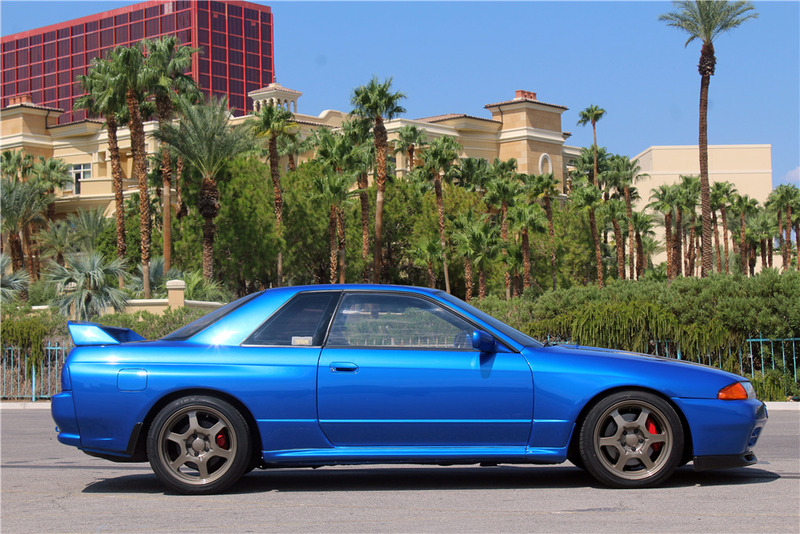 1989 blue Nissan Skyline GT-R mild custom coupe with black leather seats, an RB26DETT 276 bhp 2.6 liter/157 ci twin-turbocharged inline six with fuel injection, and a five-speed manual—$28,000 for perhaps the most interesting eighties vehicle at this auction. 1989 Nissan Skyline GT-R, linked from Barrett-Jackson’s website. 1985 gold/beige two-tone Excalibur Series IV phaeton with brown leather seats, a 5.0 liter/305 ci V8, an automatic, and 56,000 miles—$20,000 for the most prestigious of the “neo-classics,” now with an AACA judging class. 1986 rosso corsa Ferrari Testarossa coupe with black leather seats, a 380 bhp 4.9 liter/302 ci V12 with Bosch K-Jetronic fuel injection, and a five-speed manual—$82,000 is #3/Good money, according to Hagerty’s valuation tools. 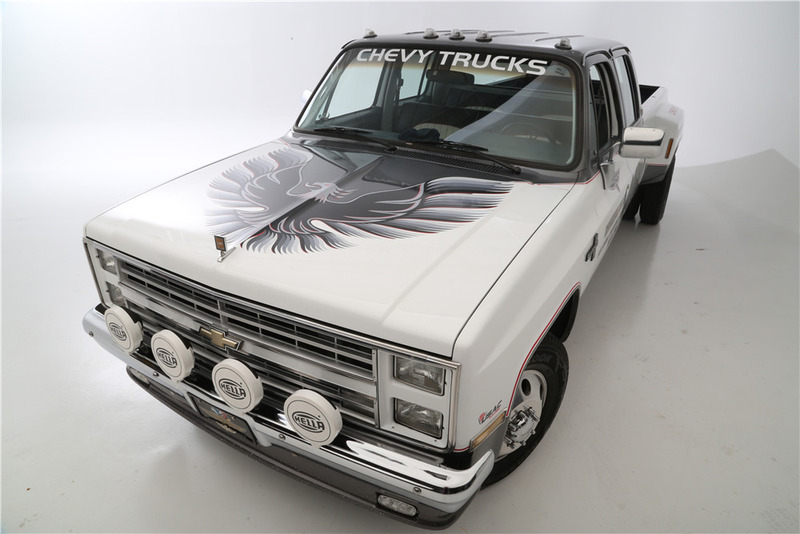 1987 white/gray two-tone Chevrolet R30 custom (just about everything) crew cab pickup truck with a white/gray bench seat, an 8.1 liter/496 ci V8 with fuel injection, and an automatic—$45,000 for this re-creation of the “Indy Hauler” truck from Cannonball Run. Re-creation of the original “Indy Hauler” featured in Cannonball Run, linked from Barrett-Jackson’s website. 1984 black Pontiac Firebird Trans Am custom (interior) hatchback coupe with black seats, an unknown 5.0 liter/305 ci V8, an automatic, and 66,000 miles—$45,000 for this promotional car associated with Burt Reynolds and the USFL’s Tampa Bay Bandits. I see a lot of Chevrolets, Pontiacs, Jeeps CJs, and Toyota pickup trucks. What do you think of this auction’s results? Mecum’s September auction in Louisville provided some fodder for commentary. I’ll concentrate on the at least reasonably stock 1980s cars (and a few trucks) that sold (remember that Mecum auctions are not no reserve auctions—a highly customized gray 1981 Jeep Scrambler pickup truck hatchback coupe with a black interior was a no sale bid up to $40,000) and add some of my opinions. Eighties vehicles were about 10% of the 332 vehicle lots sold in this auction. 1988 purple Chevrolet S10 very custom (engine, exterior, interior) pickup truck with a purple interior, a 5.7 liter/350 ci V8, and an automatic—$3,500 hammer price. 1988 black/orange two-tone Ford Econoline Harley-Davidson Edition van with charcoal cloth seats, a 4.9 liter/302 ci V8, an automatic, and 55,000 miles—$9,000 for this rarely seen special edition. 1983 yellow Jeep CJ-8 Scrambler pickup truck with black seats, a 112 bhp 4.2 liter/258 ci inline six with Carter BBD two-barrel carburetor, and a four-speed manual—at $15,500, the first vehicle in this auction to meet my criteria for serious 1980s collectability of original cars or trucks: selling for equal to or above its original base list price. I’ll mark these vehicles in bold green. 1982 butternut Cadillac Coupe DeVille with a white vinyl half top, butternut leather seats, an HT-4100 135 bhp 4.1 liter/249 ci V8 with fuel injection, an automatic, and 46,000 miles—$7,500 for a Cadillac from the days of many color choices. 1982 Cadillac Coupe DeVille, linked from Mecum’s website. 1983 Oldsmobile Cutlass Calais Hurst/Olds 15th Anniversary shifter, linked from Mecum’s website. 1980 red Chevrolet Camaro Z28 coupe with black seats, an LM1 190 bhp 5.7 liter/350 ci V8 with a Rochester four-barrel carburetor, and an automatic—$19,000 is between #3/Good and #2/Excellent money, according to Hagerty’s valuation tools. Eighties Chevrolets and Fords were heavily represented in this auction—combining for 53% of the lots from that decade. What do you think of these results? Mecum’s three-day auction in Monterey included 22 vehicles from the 1980s—7% of the 317 cars and trucks that sold. As always, I’ll concentrate on the vehicles that actually sold (remember that this is not a no reserve auction—a guards red 1989 Porsche 911 Speedster with tan leather seats and 22,000 miles was a no sale bid up to $130,000) and add some of my opinions. 1985 champagne Mercedes-Benz 380SE sedan with brown seats, a 155 bhp 3.8 liter/234 ci V8 with Bosch Jetronic fuel injection, an automatic, and 62,000 miles—$4,000 hammer price marks the usual ignominious beginning for eighties vehicles we see at most auctions. 1989 red Jaguar XJ-S convertible with a black top, black leather seats, an HE 262 bhp 5.3 liter/326 ci V12 with fuel injection, an automatic, and 26,000 miles—$6,500 for one of the first full XJ-S convertibles. 1981 maroon Datsun 280ZX hatchback coupe with red cloth seats, an L28 145 bhp 2.8 liter/168 ci inline six with Bosch L-Jetronic fuel injection, a five-speed manual, and 75,000 miles—at $14,000, the first vehicle in this auction to meet my criteria for serious collectability of 1980s cars or trucks in stock condition: selling for equal to or above its original base list price. I’ll mark these vehicles in bold green. 1987 silver Porsche 959 Komfort coupe with burgundy leather seats, a 444 bhp 2.8 liter/174 ci flat six with twin turbochargers and Bosch Motronic fuel injection, a six-speed manual, and 3,700 miles—$425,000 for this car whose front end was heavily damaged in a trailer accident. Damaged 1987 Porsche 959, linked from Mecum’s website. 1988 red Ferrari 328 GTS coupe with tan leather seats, an F105B 260 bhp 3.2 liter/215 ci V8 with Bosch K-Jetronic fuel injection, a five-speed manual, and 35,000 miles—$55,000 is #3/Good money, according to Hagerty’s valuation tools. 1985 white Buick Riviera convertible with red leather seats, an LD5 200 bhp 3.8 liter/231 ci V6 with turbocharger and fuel injection, and an automatic—$20,000 for this rare car, one of 49 Riviera convertibles built with the turbocharged engine in 1985. 1989 green, gold, and white Porsche 962 Miller High Life race car with a twin-turbocharged flat six—at $2,000,000, this multiple race-winning car finally sells after at least two previous attempts. Porsches of all types and Toyota FJ SUVs were strong at this auction, with Alfa-Romeos, Mercedes-Benzes, and Nissan/Datsuns also present. What do you think of the results? Mecum’s August auction in Harrisburg provided some fodder for commentary. I’ll concentrate on the at least fairly stock 1980s cars (and a few trucks) that sold (remember that Mecum auctions are not no reserve auctions—a red 1981 Toyota BJ42 Land Cruiser SUV with black seats was a no sale bid up to $50,000) and add some of my opinions. Eighties vehicles were about 10% of the 694 vehicle lots sold in this auction. 1986 silver Pontiac Grand Prix 2+2 Aerocoupe with gray cloth seats, an LG4 165 bhp 5.0 liter/305 ci V8 with a four-barrel carburetor, and an automatic—$7,000 hammer price. 1987 Dodge Shadow Shelby CSX, linked from Mecum’s website. 1987 black GMC Sierra Classic regular cab fleetside pickup truck with a maroon interior, an L05 210 bhp 5.7 liter/350 ci V8 with fuel injection, and an automatic—at $18,000, the first vehicle in this auction to meet my criteria for serious collectability of 1980s cars or trucks in stock condition: selling for equal to or above its original base list price. I’ll mark these vehicles in bold green. 1984 gray Oldsmobile Toronado Brougham coupe with tan cloth seats, a 140 bhp 5.0 liter/307 ci V8 with Rochester four-barrel carburetor, an automatic, and 97,000 miles—$2,000. Eighties Toronados are showing up at auction, but they sure aren’t getting any money. 1989 black Jaguar XJ-S custom (engine, transmission, wheels, tires) convertible with a black top, biscuit leather seats, an 8.0 liter/488 ci V10 with fuel injection, a six-speed manual—$35,000. If a Jag with a small block Chevrolet V8 is known as a “lump,” what is one with a Viper V10 called? 1984 Toyota FJ40 Land Cruiser, linked from Mecum’s website. 1982 Chevrolet El Camino, linked from Mecum’s website. 1982 black Pontiac Firebird Trans Am custom (body, interior) hatchback coupe with beige cloth seats, a V8, and an automatic—$60,000 for this well-done KITT replica. 1981 stainless steel DeLorean DMC-12 custom (body) coupe with gray seats, a ZMJ-159 130 bhp 2.8 liter/174 ci V6 with Bosch K-Jetronic fuel injection, and a five-speed manual—$70,000 for this Back to the Future replica. 1986 rosso corsa Ferrari Testarossa coupe with tan leather seats, a 380 bhp 4.9 liter/302 ci V12 with Bosch K-Jetronic fuel injection, a five-speed manual, and 13,000 miles—at $120,000, by far the highest eighties vehicle sale of this auction. That’s #2/Excellent money, according to Hagerty’s valuation tools. 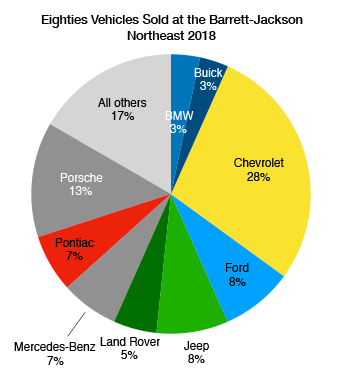 Barrett-Jackson’s third Northeast auction at the Mohegan Sun casino in Connecticut in late June included a reasonable amount of vehicles from the 1980s—about 9% of the lots offered. I’ll concentrate on the at least reasonably stock 1980s cars (and a few trucks) that sold and add some of my opinions—I’ll leave the motorcycles, tractors, and automobilia to others. Where I have covered the specific year and model of a car in this blog, I link to it. 1985 black Cadillac Seville sedan with tan vinyl top, tan leather seats, an HT-4100 135 bhp 4.1 liter/249 ci V8 with fuel injection, an automatic, and 50,000 miles—$5,200. Why these Sevilles? Why now? 1987 black Buick Grand National coupe with black/gray cloth seats, a 235 bhp 3.8 liter/231 ci turbocharged V6 with fuel injection, an automatic, and 26,000 miles—$29,000 makes this the first vehicle in this auction to meet my criteria for serious collectability of 1980s cars or trucks in stock condition: selling for equal to or above its original base list price. I’ll mark these vehicles in bold green. 1984 white Pontiac Fiero Indy Pace Car coupe with orange/gray cloth seats, an Iron Duke 92 bhp 2.5 liter/151 ci inline four with throttle-body fuel injection, an automatic, and 3,500 miles—at $9,200, less than a twelfth of the mileage of the first Indy Pace Car in this auction adds $5,200 to the price. 1988 guards red Porsche 928 S4 hatchback coupe with black leather seats, a 320 bhp 5.0 liter/302 ci V8 with Bosch fuel injection, an automatic, and 56,000 miles—$18,500. More and more 928s are making an appearance at auction; it was the turn of the S4 version at this particular venue. 1988 white Ford Mustang GT convertible with a white top, red cloth seats, a Windsor 225 bhp 4.9 liter/302 ci V8 with fuel injection, and a five-speed manual—$10,500. If you were looking for a Fox-body convertible and didn’t leave with one after this auction, you weren’t really trying. 1988 british racing green Jaguar XJ6 Series III sedan with tan leather seats, an AJ6 181 bhp 3.6 liter/219 ci inline six with Lucas-Bosch fuel injection, an automatic, and 23,000 miles—an ouch! at $3,000. 1988 red BMW M3 coupe with black leather seats, an S14 192 bhp 2.3 liter/141 ci inline four with Bosch Motronic fuel injection, and a five-speed manual—$35,000 is between #3/Good and #4/Fair money, according to Hagerty’s valuation tools. Eighties M3s have gotten serious over the last three years. 1989 red Chrysler Conquest TSi hatchback coupe with black seats, a Mitsubishi 4G54 188 bhp 2.6 liter/156 ci inline four with turbocharger and fuel injection, a five-speed manual, and 69,000 miles—$9,000 for this almost wholly vanished variant of the itself rare Mitsubishi Starion, definitively the most interesting car at this auction by the Who Saves These Cars? criteria. I see a lot of Chevrolets, Fords, Jeeps, and Porsches. What do you think of this auction’s results? As usual Mecum’s huge May auction in Indianapolis provided much interesting fodder for commentary. I’ll concentrate on the at least fairly stock 1980s cars (and a few trucks) that sold (remember that Mecum auctions are not “no reserve” auctions—a green, gold, and white 1989 Porsche 962 Miller High Life race car was a no sale bid up to $1,500,000) and add some of my opinions. Eighties vehicles were about 7% of the 1,242 vehicle lots sold in this auction. 1982 silver blue/dark blue two-tone Chevrolet Corvette coupe with dark blue interior, an L83 Cross-Fire 200 bhp 5.7 liter/350 ci V8 with throttle body fuel injection, and an automatic—a $3,570 hammer price marks an ignominious start for eighties vehicles. 1987 red Jeep Wrangler SUV with black seats, a 4.2 liter/258 ci inline six with Carter two-barrel carburetor, a five-speed manual, and 2,700 miles—at $20,000 the first vehicle in this auction to meet my criteria for serious 1980s collectability of original cars or trucks: selling for equal to or above its original base list price. I’ll mark these vehicles in bold green. 1983 beige Lincoln Continental Mark VI coupe with beige leather seats, a 4.9 liter/302 cubic inch V8 with fuel injection, and an automatic—an ouch! at $1,000. 1984 Volkswagen Vanagon Campmobile Wolfsburg Edition, linked from Mecum’s website. 1989 maroon Porsche 928 S4 hatchback coupe with tan leather seats, a 320 bhp 5.0 liter/302 ci V8 with fuel injection, and an automatic—$29,000 is #3 money according to Hagerty’s valuation tools. 1989 red Chevrolet Camaro RS hatchback coupe with gray cloth seats, an L03 170 bhp 5.0 liter/305 ci V8 with throttle body fuel injection, and an automatic—$5,500. Almost all eighties Camaro auction action centers around Z28s and IROCs; rare indeed are the sport coupes, Berlinettas, and RSs. 1989 Chevrolet Camaro RS, linked from Mecum’s website. 1987 beige Zimmer Golden Spirit coupe with tan leather seats, a 4.9 liter/302 ci V8 with fuel injection, and an automatic—$18,500. Two Zimmers in the same auction? 1982 black Porsche 930 Turbo coupe with black leather seats, a 3.3 liter flat six with fuel injection and turbocharger, a four-speed manual, and 17,000 miles—$67,000 makes for the highest eighties vehicle sale of the week. 1986 Shelby Omni GLH-S, linked from Mecum’s website. 1983 Toyota pickup truck, linked from Mecum’s website. 1985 dark red Oldsmobile Toronado Caliente coupe with dark red leather seats, a 140 bhp 5.0 liter/307 cubic inch V8 with Rochester four-barrel carburetor, an automatic, and 12,000 miles—$25,000. Suddenly, eighties Toronados are showing up at auction. 1985 Oldsmobile Toronado Caliente, linked from Mecum’s website. 1986 yellow Chevrolet Corvette Pace Car Edition convertible with a black convertible top, black seats, an L98 235 bhp 5.7 liter/350 ci V8 with fuel injection, an automatic, and 5,000 miles—part of 16 vehicle Corvette pace car collection that sold for $1.6 million. I found it striking how General Motors dominated the eighties vehicle sales at Mecum Indy—all told, GM vehicles marked 54% of eighties sales, with Chevrolet alone accounting for 37%. What do you think of these results? This year’s March auction at Mecum Kansas City provided some interesting fodder for commentary. I’ll concentrate on the reasonably stock 1980s cars (and a few trucks) that sold (remember that Mecum auctions are not “no reserve” auctions—a green 1985 GMC High Sierra pickup truck with a tan vinyl bench seat was a no sale bid up to $18,000) and add some of my opinions. This covers the eighties 8% of the approximately 250 vehicles sold over two days. 1986 desert tan/brown two-tone Ford F150 XLT Lariet pickup truck with a tan cloth bench seat, a 5.8 liter/351 cubic inch V8, an automatic, and 105,000 miles—$5,000 hammer price. 1983 gray Chrysler Cordoba coupe with red cloth seats, a 130 bhp 5.2 liter/318 ci V8 with a Carter two-barrel carburetor, an automatic, and 45,000 miles—$3,750 for one of the most unusual cars at this auction. 1983 Chrysler Cordoba, linked from Mecum’s website. 1980 white Chevrolet Corvette coupe with oyster leather seats, an unknown (could be an L48 or an L82) 5.7 liter/350 ci V8 with Rochester four-barrel carburetor, and an automatic—$12,000 is around #3/Good money according to Hagerty’s valuation tools. 1980 green/white Ford Mustang hatchback very custom coupe with black seats, a 521 cubic inch V8, and an automatic—$11,000 for this drag car. The eighties portion of this auction featured a lot of Chevrolets and Fords. What do you think of this year’s results?